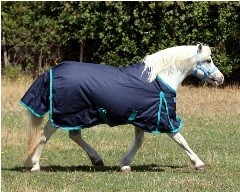 * Our rugs fit highter on the wither & shoulders this prevents rubbing & makes a FANTASTIC FIT. * Anti-rub mane & shoulder panels. * Extra wide tail flap for extra warmth. * Belly surcingles with rubber stops. * NON SLIP, rug stays where its meant to. * Quality leg straps & Buckles. 5'9 Navy/Aqua Winter Rug $ 169.00 No Stock!